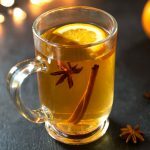 Apple cider is perfect for gatherings with friends, family dinners, Christmas parties… or just about any cold winter night. It's naturally sweet, infused with cinnamon, cloves, star anise, and a hint of citrus from the oranges. Juice the apples first. Then transfer the juiced apples (cider) into a medium saucepan. If you'd like to extra the full flavor from the whole spices, toast them in a small saucepan over medium-high heat until fragrant. Set aside. Carefully insert the whole cloves into the half of an apple (this will make it easier to remove the cloves later). You can also use a spice bag, cheesecloth, or add the cloves to the cider loose. Add the half of an apple with cloves into the cider together with the orange slices, the cinnamon stick, and the star anise pod (if using). Bring the cider to a simmer over medium heat and simmer for an hour or mull for up to 4 hours. Remove the apple, orange, cinnamon stick, star anise, and any clove remnants from the pot. Serve the cider hot, plain or with a slice of orange/lemon. *Use a variety of apples. If you have access to cider apples, use those. If not, choose from Baldwin, Cortland, McIntosh, Granny Smith. *If you don't have a juicer, use store-bought non-alcoholic, non-sparkling apple cider instead (not apple juice).